Although Bordeaux is not in the Lot-et-Garonne (it's in our neighbouring département to the west, the Gironde), it is the legal and administrative centre of our region, Aquitaine. 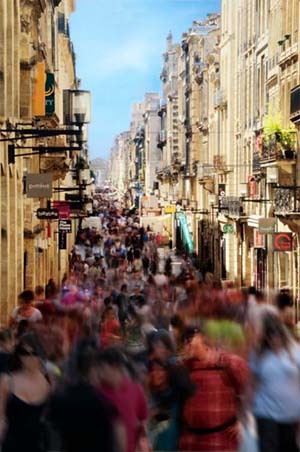 Bordeaux is a beautiful city and well worth a day out; indeed Victor Hugo found the city so beautiful he once said: "take Versailles, add Antwerp, and you have Bordeaux". Not for nothing has Bordeaux the only city centre in the world to be declared a UNESCO World Heritage Site. When Emperor Napoleon III wanted to transform a then still quasi-medieval Paris into a "modern" capital that would make France proud, he requested that Bordeaux's wonderful buildings be used as a model. The architecture of Paris is therefore based on the architecture of Bordeaux and not the other way round, as is commonly believed. The quays alongside the river Garonne have been comprehensively refurbished in the last few years and now include the fabulous 'Miroir d'Eau' (which means 'water-mirror' in English). When static the Miroir d'Eau reflects all and everyone around it. Then every twenty minutes a myriad hidden jets emit a fine spray from the feature and hundreds of people walk barefoot through the cool mist, just because it's such fun. The two photos above were taken at the Miroir d'Eau and show it both in its mirror state and in its spray state. The Miroir d'Eau is a great photo opportunity! And, for those who like a little retail therapy, the fabulous rue Sainte-Catherine is the longest pedestrianised shopping street in Europe. Stretching 1.25 kms from la Place de la Victoire at one end to la Place de la Comédie at the other, la rue Sainte-Catherine has more than two hundred and fifty shops! Incidentally, it isn't always this busy, the photo of the rue Sainte-Catherine on the left was taken in the height of the August holiday season!